"Fr. Nicolas Wenders and Fr. Edmond Van Genechten"
“Fr. 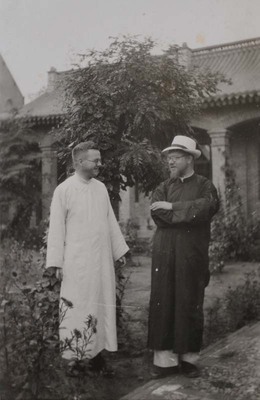 Van Genechten spent 24 hours with us after having been taken for three days by the fugitive soldiers of (warlord) Souen tien ying (Sun Dianying 孫殿英).” Fr. Nicolas Wenders on the left, Fr. Edmond Van Genechten, CICM, on the right. Fr. Nicolas Wenders and Fr. Edmond Van Genechten. August 1933. Société des Auxiliaires des Missions (SAM) China Photograph Collection, Whitworth University Library, Spokane.